There is an additional problem for me. 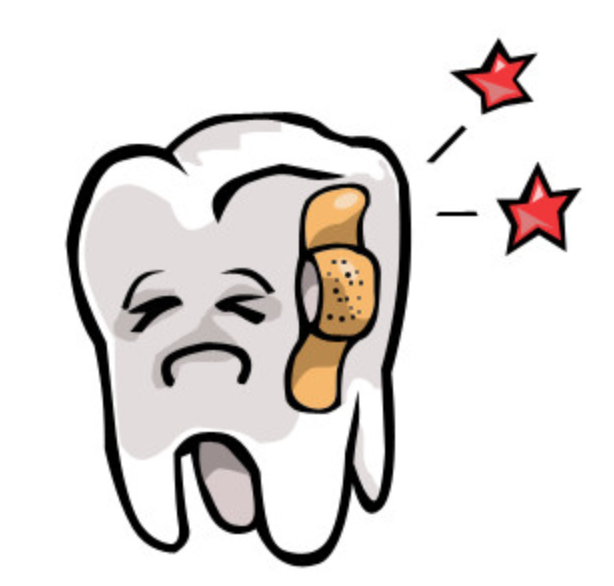 The week before the cold and cough hit me, I got a tooth ache and took antibiotics for an abscess and booked a time for a root canal with a new dentist. Well, you can't do one of those for two hours and have a bad cough..... so the appointment was moved to April. That was okay until this past Friday when the tooth woke up again and so now I'm back on the antibiotics again. There was NO weaving for at least three weeks. I had zero interest and we found that we both were too tired to focus on things. Eventually, we have slowly come back to life and some lovely sunny days really helped cheer us up. We have made plans for the garden tidy up, what needs pruning, replacing and maybe even new patio furniture? Now the rains have returned but it was sunshine enough to know its spring and we'll be back in the sunshine again soon. 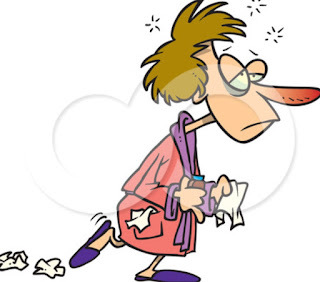 Life has gone on around us and very nicely left us alone while we were sick. I have been weaving two concept shawls (both the same) and have one finished but not pressed and the other is just as it came off the loom. So they need to be completed and photographed for show and tell. This is all I can give you for now. Just as I completed the first shawl, I received a request to weave a special shawl for a client who has three weddings in May. So I got busy winding a warp and here we have 700 ends of 10/2 tencel being beamed this past week. Weft will be ivory silk. So sleying is well under way and then a 12 shaft tie up to be done...therefore nothing to show you there yet. I sold two of the four recent table runners, and two kitchen towels to one weaver, and also a silk scarf to another weaver! This must the kindest compliment a weaver can get. 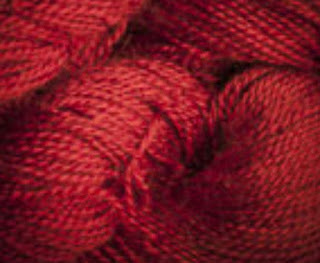 😊 Then I got another commission to weave two silk scarves for Christmas 2017 gifts (so no great hurry)! So I had better shake off my cough and fix this %$#& tooth and get BUSY! The picture doesn't do the depth of shade justice.... its lovely, but not what the client wants for a red. The next bit of news is one of those "special person", and a "special moment" kind of thing. I frequent (mainly lurk) at some Ravelry weaving groups and follow along. One is a page where people reveal their finished projects and do some show and tell. 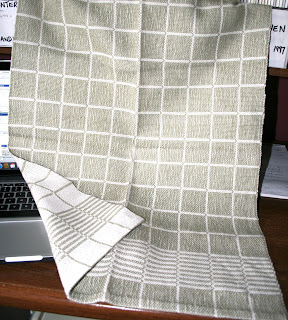 One weaver, also named Susan, posted about her newly finished turned taquette towels and I was quite struck by them. I cheekily suggested she could mail one to me and asked if she would like my new address? Susan said YES! I said I was only kidding and she said she wasn't. Oh, my! So big thank you to Susan in Staunton, Virgina! Its not going to be used as a towel of course and will be in my studio. Fully reversible and impeccably woven on her Glimakra.... and with hand sewn hems! I was caught a bit short of full sized towels to do an exchange but I did have one guest towel left in the huck lace diamond pattern from this older post and she liked it very much! I wish you could feel how soft this towel is. Susan used 10/2 American Maid cotton from Lunatic Fringe. If the dollar ever goes to par again, I would order some and give it a try myself. Birthdays came and went.... Bruce turned his odometer one more turn, but we were both too sick to do much other than to write a rain check for a better time for his birthday dinner and cake. I must say that he did a fine job of celebrating my recent birthday with me and I had a lovely day and received many calls from family and friends. But we both agree that the numbers are starting to pile up and there are moments when when you find yourself wondering "where the heck all the time went!!" I thought it would take far longer to get old. 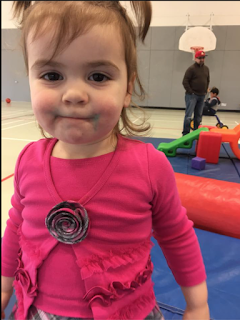 Another birthday at the opposite side of the age spectrum is this little cutie patootie, our grand daughter Madison who just turned two. I love phone calls with her as she says "hi Nana"..... and then tells me all about everything! Ethan will be five in April and is very much an active boy and into all the boy toys. 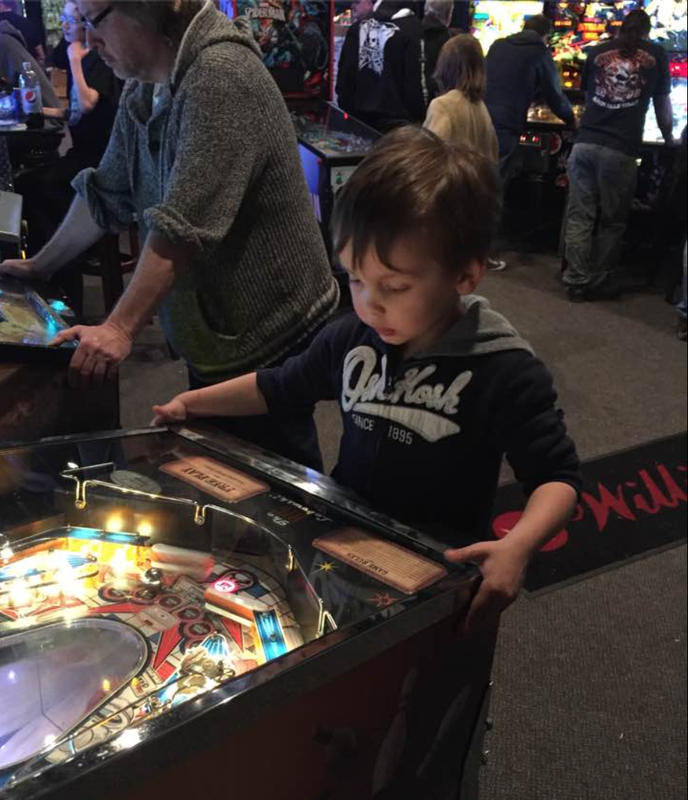 Here he is last week helping Dad at a pin ball conference. He's pretty good at it! That's also the most stationary I have seen him as he's usually a blur! 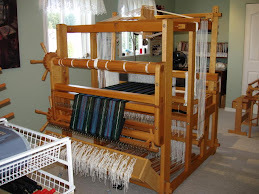 Well, this post is a mixed bag of news and such and hopefully I will have things back on track for more show and tell and weaving related. I'm hoping to show you my birthday present to myself as well. I have a new traveling spinning wheel on order and on its way to me. 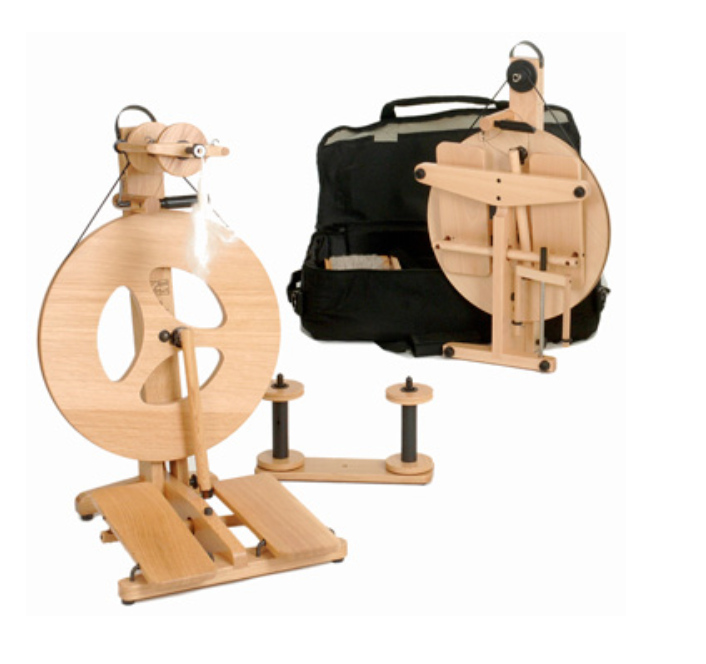 It comes in either beech (shown) or oak and I won't know until it gets here!